The voting is complete, attendance is confirmed and we are ready to go with the HRL mid-summer classic. This year’s festivities will take place at Pilot Knob in Eagan for the 15th year of the HRL. The Fun Star Game will kick off the night with your favorite “fun” HRLers at 5 PM. 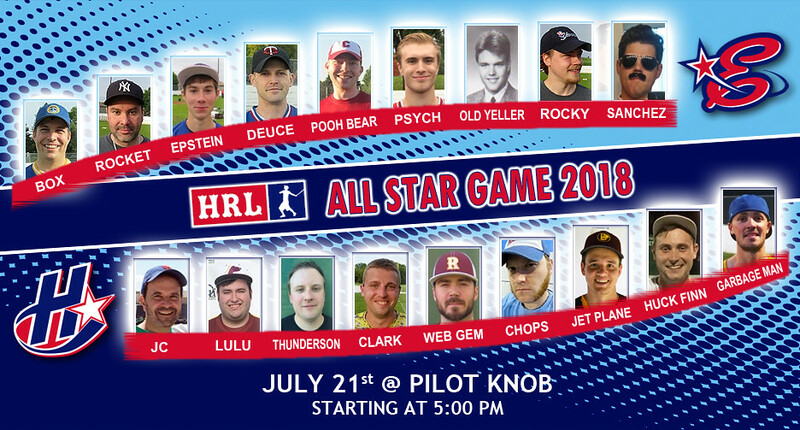 All Star Night will also feature a running HR Derby where any HRL fan or player can pay $5 to see how many HRs he/she can hit before recording 10 outs (any swing not resulting in a HR is considered an out). We’ll also have a nice new little wrinkle for the HR derby so stay come check that out. Whoever hits the most HRs in one round before the end the night will get half of the pot, with the other half of the money going to the HRL league fund.